At some point of your many years of dog ownership, you might have wondered whether dogs can blow their nose as people do. The question is actually a good one, considering that dog noses have many things in common with human noses (scenting abilities aside) and one thing in common is the fact that dog noses can also turn runny and start dripping profusely. Before passing your dog a Kleenex, you may want to discover if dogs blow their noses like people do, and if they can, exactly how do they manage to do that? Dog noses are not normally runny, yes, they can be wet, but not so much to cause visible dripping, so if your dog’s nose is dripping a lot recently, you may want to consult with your vet because this shouldn’t be normally happening. 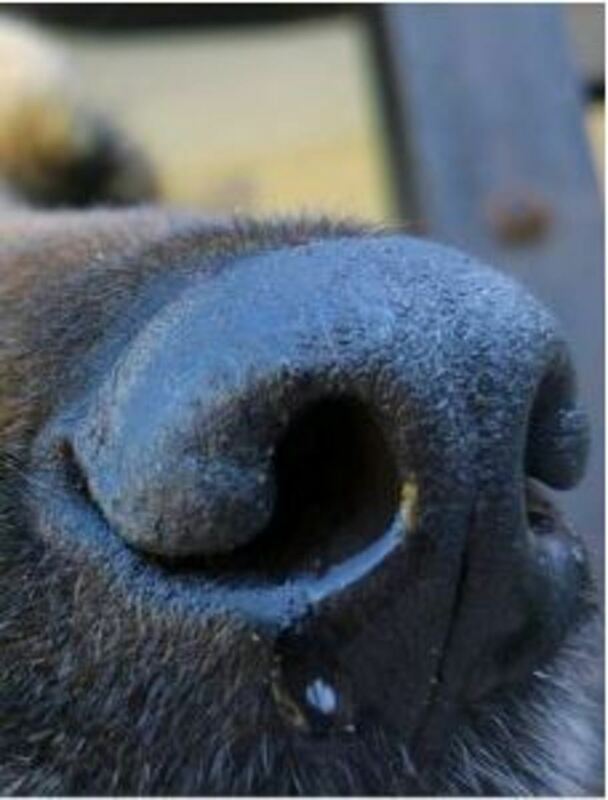 When a dog’s nose is visibly dripping and the secretions start getting caught on the dog’s facial hair, this suggests that the volume of the nasal secretions is significant and exceeds the ability for the dog’s body in removing them. So if your dog’s nose is runny, see your vet. Your dog may be suffering from allergies, an upper respiratory infection when both nostrils are involved or some foreign item stuck in the nose causing irritation, presence of a nasal polyp, a tooth root problem or even a tumor when only one nostril is affected. As in people, the color of nasal discharge in dogs can provide some insights on the matter. A clear discharge is likely to be caused by a virus, just like people get a cold. In such a case, symptoms should subside within a few days; however, at times these “colds” can progress into a bacterial infection requiring veterinary care, points out veterinarian Dr. Marie. When the discharge instead is yellow or green, this can be indicative of a respiratory tract infection, and in such a case, antibiotics may be needed from the vet. On top of the thick, purulent discharge, affected dogs may run a fever, lose their appetite and become lethargic. Well, dogs won’t blow their nose as people do, meaning that they’ll grab a tissue and just forcefully blow their nostrils until their nasal passages feel clear. However, dogs have their own canine way of getting rid of annoying nasal secretions. Actually, dogs are so good at “blowing their noses“, that you may hardly know their nose was actually dripping. First of all, any sensation of watery secretions are immediately felt by dogs and they are therefore quickly wiped off with a quick flick of the tongue. This is the canine equivalent of using a tissue to wipe a runny nose. You may barely notice this, as it happens so quickly, but if you take a look at the picture on the right, you can see how a dog’s tongue can effectively reach the nose to wipe off any discharge. At times, when a watery trickle is allowed to drip down the nostril, the trickling sensation of nasal discharge dripping down the nostril evokes a sneezing reaction, which causes any discharge to be quickly expelled in the environment through the forceful expulsions of air from the lungs through the nose and mouth. At other times, dogs may voluntarily blow air out of their noses. The “air blow” may be similar in noise to the noise produced when people blow their nose, but only thing is that there is no tissue to conveniently capture the discharge. Unfortunately for dog owners, this often means snot being discharged just about anywhere! Just like seeing nasal discharge should prompt owners to schedule a vet visit, so should excess sneezing or blowing air through the nose. All these signs point to something that needs investigating so to find the underlying cause and getting it properly solved. National Geographic, Do Animals Blow Their Noses? Dog Word of the Day: What is Flea Dirt?